Windows Media Video (WMV) is a compressed video file format for several proprietary codecs developed by Microsoft. A WMV file is in most circumstances encapsulated in the Advanced Systems Format (ASF) container format. The file extension .WMV typically describes ASF files that use Windows Media Video codecs. However, for Mac users, it’s a little bit head-scratching for them to play WMV files on iPhone because the compatibility of iPhone video supported is not very satisfying. Not every video file can be played on iPhone. i.e., MKV, MTS, AVI and WMV. Users have to convert WMV to iPhone to play WMV-based videos on the device. 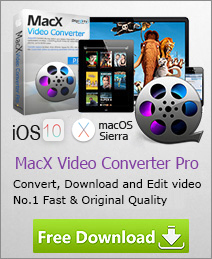 World's Fastest WMV to iPhone Converter! No.1 fast video processing software to decode WMV video to iPhone Xs/X/8/8 Plus/7/6s more with the fastest speed (5X faster than any competitor). As you can see, all the iPhone models support the playback of video encoded using either MPEG-4 or H.264 codecs. What's plus, the latest models from iPhone 6s to iPhone X, they can also make HEVC video codec playable thereon. So the next question came up: How to change a WMV to iPhone on Mac? Is there any professional iPhone converter to solve this problem? MacX Video Converter Pro works seamlessly on macOS (Mojave) to help you convert WMV video files to iPhone 8/Plus, iPhone Xs/X/7/6s/6/Plus/SE/5s, Samsung Galaxy S9 edge/Note 9 more. More importantly, the whole WMV to iPhone conversion is 5x faster than other tools online thanks to its pioneering use Intel's QSV/Nvidia/AMD hardware acceleration tech. The tips below will introduce a step by step guide to tell you how to decode WMV video to iPhone formats on macOS. After Free download mac video transcoder, launch it and click "Add Files" to load the WMV files. Also a version for Windows (10) is available. Choose "To iPhone" as output format. MacX offers output profiles for all kinds of iPhone, including iPhone Xs/X/8/7/Plus, iPhone 6s/6s plus/6/6 plus/5s/5c etc. For the models older than iPhone 6s, you're suggested to opt for MP4 (H264) as output formats. As for iPhone 6s and latter newer devices, HEVC MP4 is worth your consideration, esp video with 1080p or 4K 2160 high resolution, cuz it can save your 50% storage space while remaining the same level of high quality compared with H264 codec. One more tip: if you wanna play 4K 60FPS video on your iPhone, you'd better to compress 4K to 1080p and lower 60fps to 30fps, for most iPhone doesn't support the real 4K video playback (unqualified display resolution) at 60fps. Click "RUN" button to start converting wmv files to iPhone H264 or HEVC codec. You can view the conversion progress and cancel the process at anytime.